The military accord, sealed during last month's summit in Pyongyang, is one of the most concrete agreements between the neighbours this year. But U.S. officials have raised concerns that it could undermine defence readiness and comes without substantial progress on denuclearisation. The zone, effective Nov. 1, will extend 40 kilometres north and south from the Military Demarcation Line in the East and 20 kilometres in the West for fixed-wing aircraft. The department "remains in full support of our diplomats as they work to achieve the verified denuclearisation of the DPRK as agreed to by Chairman Kim (Jong Un)," Logan said, referring to North Korea by its official name, the Democratic People's Republic of Korea. A spokesman at South Korea's defence ministry said Seoul cooperates closely with Washington and the U.S.-led United Nations Command (UNC). 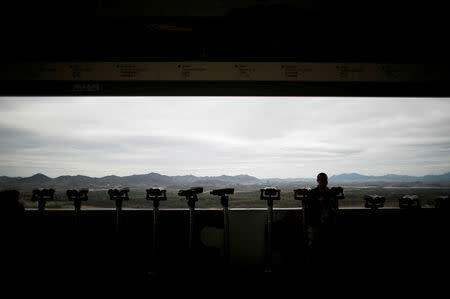 On Tuesday, North and South Korea held their first three-way talks with the UNC to discuss "practical" steps to facilitate the military pact, but did not announce any concrete measures, Seoul's defence ministry said. "They're not even close to an agreed definition of 'hostile acts'", said Baek, who served as a vice defence minister in 2013-15. Kim vowed to work toward denuclearisation during his unprecedented June summit with U.S. President Donald Trump. But Pyongyang's actions have fallen short of U.S. demands for irreversible steps to scrap its arsenal, including a full disclosure of nuclear facilities and materials.